Boston – Oct. 9, 2018 – One year ago, Rally™ Recruitment Marketing launched with the vision of bringing together recruiting and marketing professionals in a new community for learning and sharing marketing best practices to modernize talent acquisition. 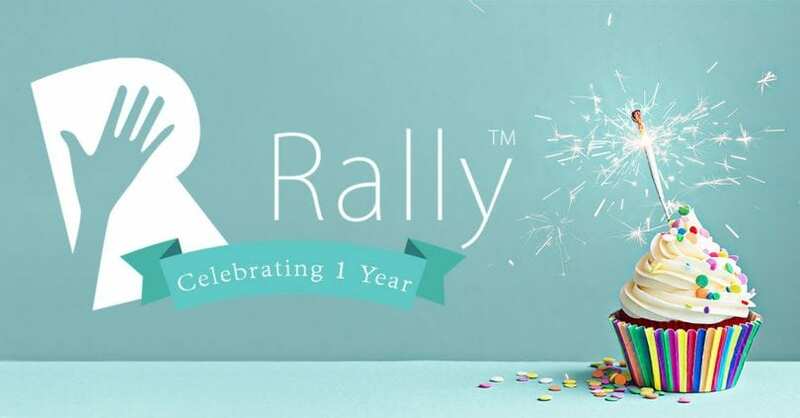 Today, Rally announced that it has reached the first-year milestone of attracting 10,000 professionals to its community, becoming the largest community for the rapidly growing discipline of Recruitment Marketing. Over the past year, through Rally’s educational content and events and with the support of Recruitment Marketing pioneers and leading HR tech providers, thousands of professionals have turned to Rally to learn strategies and skills in employer branding, candidate experience, content marketing, digital marketing, lead generation and social media. By adopting best practices from B2C and B2B marketing, HR and talent acquisition teams are giving their employers a competitive edge in attracting and recruiting today’s socially engaged and digitally connected candidates. 10,000 professionals have become part of the Rally Recruitment Marketing community. These professionals work in human resources, talent acquisition, recruiting, sourcing, candidate experience, recruiting operations, employer branding, recruitment marketing, marketing and communications, inclusive of all skill levels, all career levels and at companies of all sizes across all industries. 30 professionals have benefited from Rally’s free mentoring program, which supports new Recruitment Marketing practitioners with strategy guidance and career coaching. 14 Recruitment Marketing pioneers are volunteering their time and expertise as mentors to the community through blogging and one-on-one engagements. 11 leading recruiting technology providers and recruitment marketing agencies are helping to advance the Recruitment Marketing discipline by sponsoring Rally’s educational mission. Sponsors include: Alongside, Clinch, Glassdoor, Lever, Stories Incorporated, Talemetry, TextRecruit, The Muse, TMP Worldwide, Vizi and Workable. In June, Rally became recognized by the Society for Human Resource Management (SHRM) to offer Professional Development Credits (PDCs) for the SHRM-CPSM or SHRM-SCPSM, and is approved to provide HR (General) recertification credit hours toward aPHR™, PHR®, PHRca®, SPHR®, GPHR®, PHRi™ and SPHRi™ recertification through HR Certification Institute® (HRCI®). 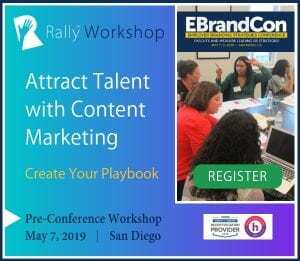 Last month, Rally launched the first hands-on workshop to teach recruiting practitioners how to attract talent using best practices in content marketing. Workshops have been held in Washington, San Jose and Boston, with New York scheduled for Oct. 22. Today’s candidates discover employers through social media and online search, and are influenced by brand awareness and employee reviews. To help employers break through the digital noise, the HR tech industry has innovated with new recruiting solutions for finding and attracting talent. As a result, B2C and B2B tools for website personalization and conversion rate optimization, email, text and chat communications, programmatic digital advertising and social media engagement are now part of modern recruiting platforms. The need to upskill recruiting practitioners with the marketing know-how to successfully embrace these strategies and adopt these tools has rallied leading HR solution providers to partner with Rally to help educate the market.